Client satisfaction through rapid interaction and arranging the extras. Welcoming changing requirements, even late in development. The client immediately sees the consequences of his request. The team collaborates closely with people who have mastered energy-neutral renovation. Projects are built around motivated individuals who can be trusted. Appealing examples are the principle measure of progress. Simplicity, the art of maximising the amount of work not done, is essential. Because of the flexibility and process-efficiency reached by collaboration in a scrum-team this way offers great advantages in retrofit projects, especially energy-efficient renovation with a high demand of quality and workmanship. In an retrofit proces the organization of the team, the assignment and function of every team member is similar - the situation (every project differs) continually changes. An autonomous scrum-team consists of the local architect/ engineer and the planners of the local contractor and installer. The architect or engineer tries to represent the client as well as possible. He or she is not an extension of the client, which is currently standard practice, but is a member of the Scrum-team. The architect is contracted by the team and just like the other team members he or she is employed and receives a bonus based on the profit made. 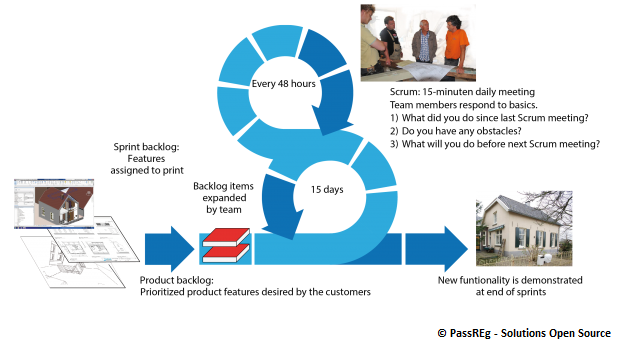 The manager of the team is called the “Scrum Master”. After introducing the client into the scrum-team approach, preselecting the team and pre-contracting, the members of a scrum-team visits the resident who is going to renovate his/her property. Together they sketch out a scenario, the resident fully participates in this process. To help the team to solve complex (design-)matters, each project is divided into sub-problems with sub-solutions, which are worked on by the according members of the team. Analysis: What does the client want? Analysis: Are all the requirements of the client possible? Analysis: Can it be built and easily worked out? In fact, this resembles the eight systems engineering steps, but without the administration required for verification and validation. Increasing the effectiveness of the team. Monitoring the progress of the team. Monitoring the progress of the project. Mapping out and minimising the risks. The first projects need to be intensively supervised to introduce the innovation and method into the team. This is considered as a good way to persuade the early majority to introduce the innovation of energy-efficient retrofit into their daily practice. The daily practice within SME companies hardly differs from that sketched out above, but is fragmented in different companies and responsibilities. This organizational and mental hurdles can be replaced by an integrated method to evoke synergy of all disciplines. This paves the way for cost-efficient high-standard energetic renovation. John Ruskin states: “Everything costs its own cost, and one of our best virtues is a just desire to pay it”. In other words: It’s unwise to pay too much, but it’s worse to pay too little. When you pay too much, you lose a little money — that is all. When you pay too little, you risk to lose everything, because the thing you bought was incapable to do what it was bought for. The common law of business balance prohibits paying a little and getting a lot. If you deal with the lowest bidder, it makes sense to add something for the risk you run, and if you do that you will have enough to pay for something better. Retrofit requires an integrated investment approach that calculates all costs including maintenance and operational costs. The Bake house project shows that people have become conditioned to consider bidding as the purest way of achieving an honest price. While in reality, it just heralds the start of bargaining and haggling. It only concerns the business and not the quality of the product from the consumer’s perspective. How are you going to break this impasse?